If you could get one article to bring in $50 to $500 per month, every single month, (without doing any additional work after the article has been published)...how many articles would you create? If you could have one of your articles published on over 400 different web sites, in a matter of weeks, so that they all continued to bring in more traffic, subscribers, and sales for you, on complete autopilot... how many more articles would you attempt to do that with? If you're skeptical of these claims, I certainly don't blame you. 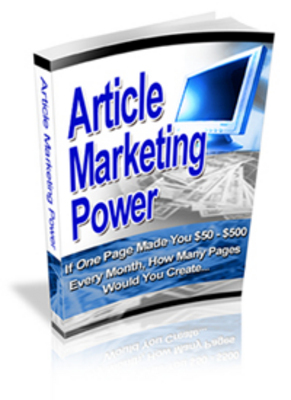 In my new special report, Article Marketing Power, I show you how it's done.. Article Marketing Power with Resell Rights article marketing;website promotion 131948790 2.95 qiqi Fresh Download Available!